Installing a new bathroom vanity can undoubtedly change the look of a bathroom. 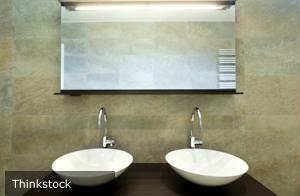 However, some people may choose to keep their existing vanity and give the room a makeover by adding a new sink. "Even if you haven't done any shopping yet and just have a rough idea of what you want, the sink you'd like to find is probably out there," designer Julia Diaz told Better Homes & Gardens. "A few years ago, some of the major companies started creating sinks that looked like they could be hanging in a gallery somewhere. When I was little, you'd go into someone's bathroom and there would just be a white, round sink. Today, the white, round sink is the exception." Experts say it's important to learn a little about the different types of sinks available before making a decision. Above-mount, drop-in and vessel sinks are all common in today's bathrooms. One benefit to choosing a sink that is mounted on top of a vanity countertop is that it elevates the sink and can mean less bending and more comfort, especially for tall people. It's important to note that sinks are not just round or oval anymore, either. They are available in different shapes, colors and finishes to complement any décor. The only limitation, according to experts, is plumbing. According to Kohler.com, it's important to make sure that a sink is compatible with your faucet.